Long before Mark and I moved back to the land, my parents made the same journey. They stayed just long enough to get me hooked on the idea then fled to the nearest town a decade later. Now's your chance to hear about their journey straight from the horse's mouth. My father's newest poetry collection spans those eleven years and includes gems like Food Rules (showing how strangely obsessive I was at 5 years old), along with many farming verses that are both beautiful and insightful. Since I know the word "poetry" probably made many of you hyperventilate in a corner as soon as you read it, I thought I'd sweeten the pot this time around. 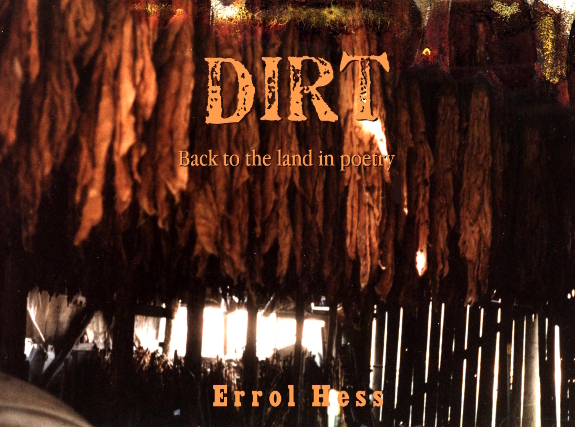 Dirt is free on Amazon today and tomorrow. I hope you'll try a copy and then leave a review if you like what you read. My father would really appreciate it! Last week's frosts nipped back most of the tender summer plants, only missing a few zinnias nestled up against the side of the house. 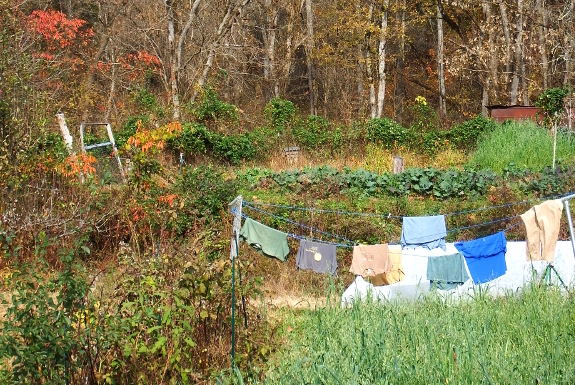 In the garden, a few late figs might manage to ripen despite the freeze and a few pepper plants still have green leaves. Otherwise, though, the summer crops are a thing of the past. Leaf colors changed fast with the wake of the weather change as well. All of the beautiful yellows of mid October immediately started blowing out of the trees, to be replaced by hints of red here and there. This is such a golden season --- warm enough to go outside in t-shirts in the afternoon but cold enough to require warm blankets at night. There's something to love about every season, but I think fall is my very favorite time of the year. Went out looking for a loveseat today and ended up with this 100 dollar bargain. 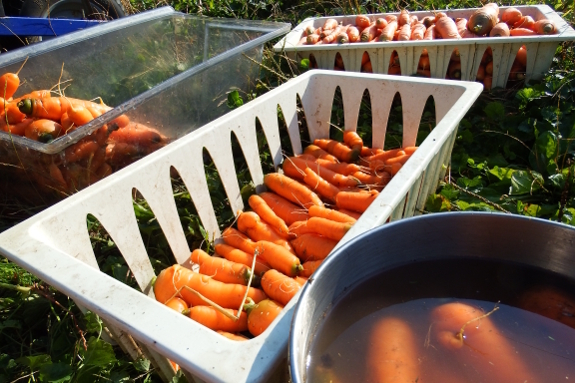 Harvest date for our fall carrots varies widely. If I'm on the ball, I dig them in mid September just in time to put down a fall planting of oats. This year, I've been doing the bare minimum, so I let them ride until after the first frost sweetened their orange roots. I could have let the crop go another month or so, actually, until hard freezes are threatening. But I'm running out of the easy-to-harvest, gargantuan carrots in the front garden (right outside the kitchen door), so I figured I might as well dig up the mule garden's more moderately sized haul. 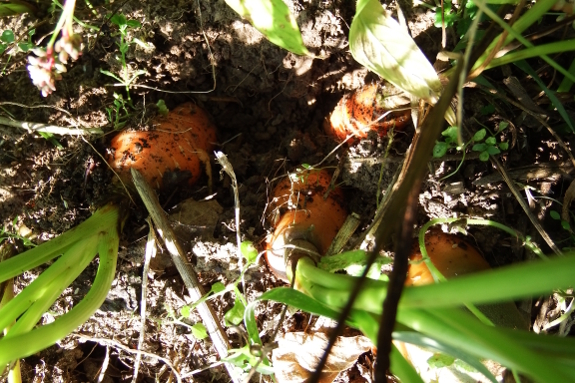 Even with the current mini-drought (1.1 inches of rain in October), the carrots came out of the ground relatively easily. Only one bed that hasn't received as much organic matter was hard as a rock --- I felt like I was chiseling those carrots out like fossils. Half the harvest (not all pictured) were easy to dig, wash, and sort in a couple of hours work Wednesday afternoon. I figure our total yield for the fall carrots will be around 2.5 bushels...and most of those are going in my stomach since carrots are one of the few vegetables my body can currently handle. 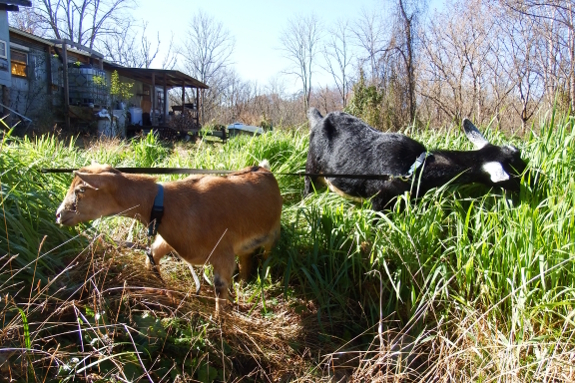 Thank goodness I overplanted for the sake of the goats! We had a fun visit to the big city park today. I'm now officially a FODMAP believer. 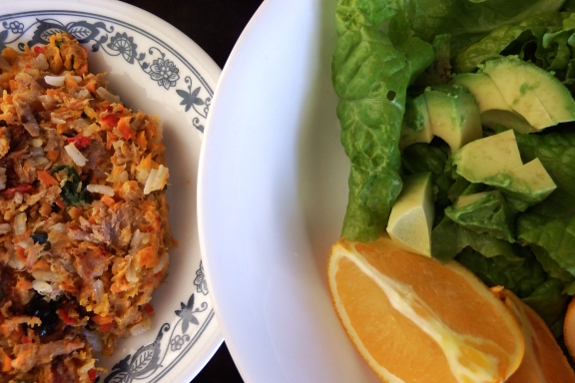 After months of awful diarrhea, nine days of a low FODMAP diet turned me 100% regular. Time to start adding categories back in to see which one(s) were messing me up. 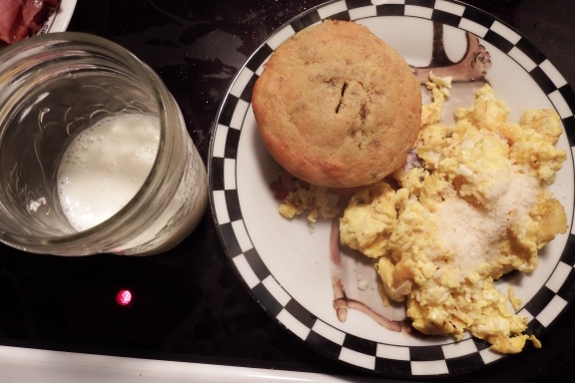 I started with milk, which I was pretty sure wasn't going to cause a problem. After all, I'd never had trouble with lactose intolerance in the past. Day 1 --- one quarter cup of milk and all's well. Day 2 --- half a cup of milk and back to the explosive diarrhea. The interesting part is that my symptoms occurred eight hours after imbibing. Which means all of my previous correlation analyses (I ate x and then ran to the bathroom immediately) are invalid. Time to rest the gut again, then move on to test two. Shall I hit honey (fructose) or garlic (fructans) next? Another picture from our fun day in the park yesterday. 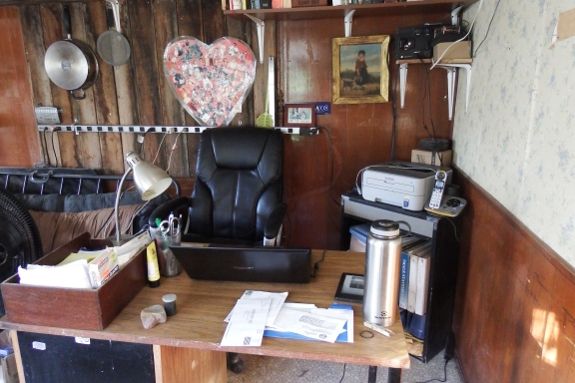 This year's top reorganization priority is my homestead office. After finally caving and buying a comfortable chair this summer, my current workspace was no longer working. 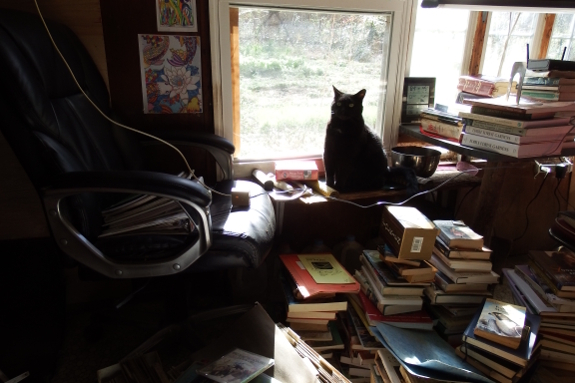 Which was actually a much-needed nudge, since I ended up with a lot of books to discard once I pulled everything off the shelves. Here's phase two --- shelves removed and only the items I use at least once a month returned to the office zone. Mark has promised to build me a storage futon to continue the renovation into the left side of the photo above, and I'm pondering that big bare wall on the right with its ancient floral wallpaper. 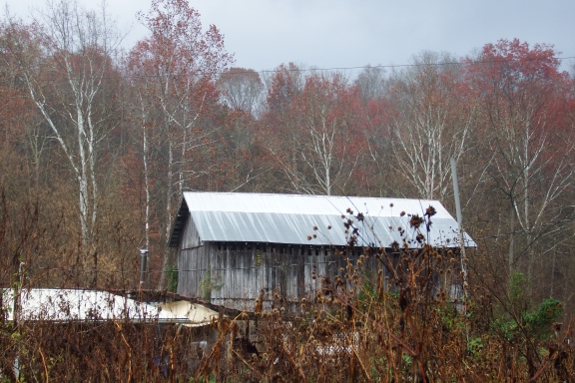 Am I really to the point in my homesteading adventure where I'm considering adding a coat of paint? I think I like the Tractor Supply buckets a little over the Lowes equal size bucket. I don't usually notice interior design, but off and on over the last decade I've been drawn to certain spaces. What have they all had in common? Accent walls --- one wall of bright, stark color that contrasts vividly with the rest of the space. I figured the now shelfless wall could be my first stab in that direction. 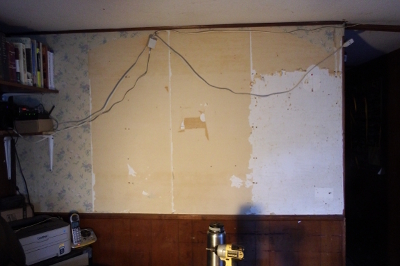 But before I could start thinking about colors, I had to strip off the old wallpaper. 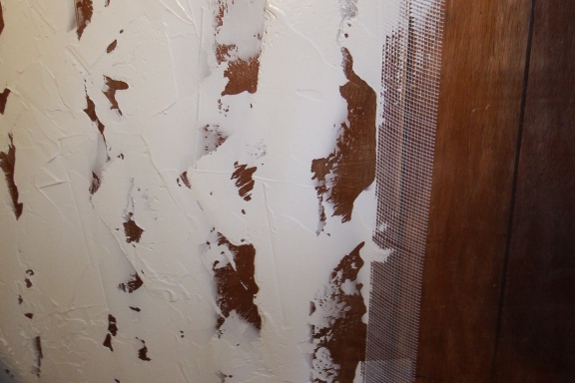 My previous experience with wallpaper removal involved a steamer, some kind of chemical, and a seemingly endless amount of scraping. I wasn't particularly anxious to repeat the process. To my surprise, when I tested a bit of my office wall Saturday morning, I found the paper easy to remove with only the supplies I had on hand. Rip back the plasticy outer layer, dampen the plain paper below with a wet rag, then scrape. Very satisfying! Looks like step one of the accent wall is well within my reach. What would I do different on the milking stand we built two years ago? Make the neck brace out of two pieces of curved solid plywood. 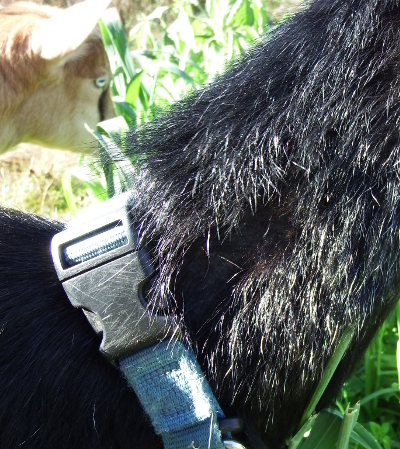 The way I built the neck brace in pieces made for weak points an aggressive goat could eventually break apart after days of banging during milking time. 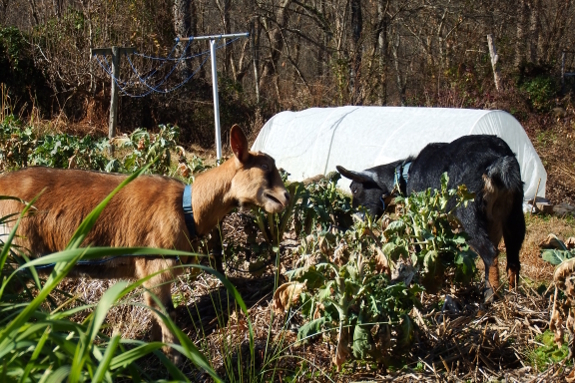 Sometimes when I'm lazy, I bring the goats to the garden without a tiedown stake. Instead, I slip their leashes over my foot and settle in to read. 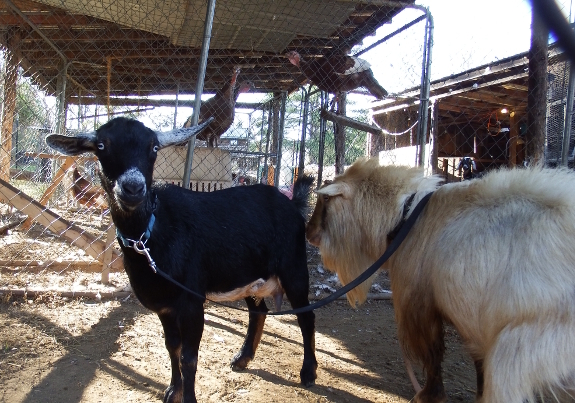 The trouble with the toe tiedown is that I get engrossed in my book and the goats yank, yank, yank until they get into something they're not supposed to. Bad, Artemesia! That broccoli is for humans! You know you've been had when your goats stick out their tongues at you. We harvested a good size basket of carrots today. 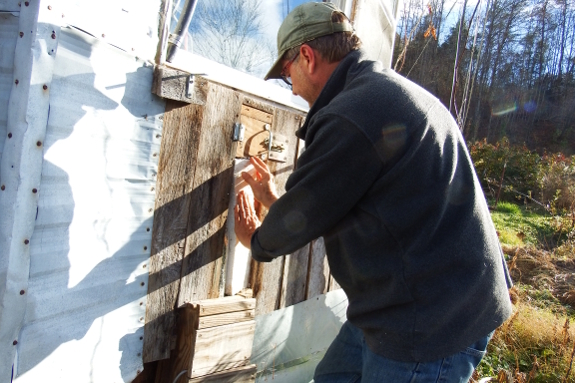 Yes...we still use the refrigerator root cellar to store most of the carrots. I hope that most of you have perfect digestion. 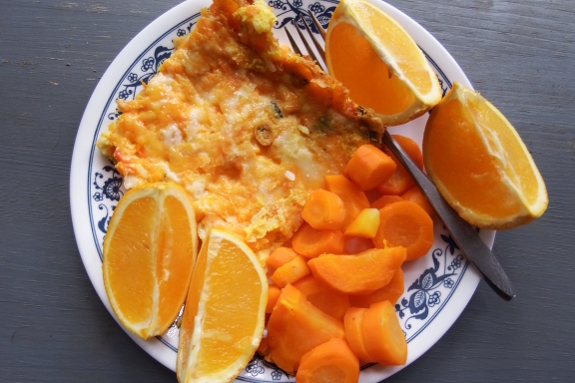 But I thought I'd share my FODMAP reintroduction plan anyway since it's estimated that 10 to 15% of the world population suffers from irritable bowel syndrom and since a low-FODMAP diet has been proven to mitigate symptoms in 70% of cases, especially if your problems run toward, well, the runs. In other words, I expect hundreds of our readers could benefit from this information. If that sounds like you and you turned regular after two to eight weeks on a low FODMAP diet, it's time to start testing which category or categories of FODMAP are bothering you. The idea is to pick foods that have only one type of FODMAP in them, then to test each food at a low, medium, and high level over the course of three days. If you experience symptoms, you note that category down as a no-go (for now), then rest your gut for at least three days until it's back in shape before testing the next round of food. One study following up with folks who had been on the low FODMAP diet a year earlier suggested that wheat, onions, and dairy are the most likely to still be giving people trouble at that late date. So (despite what I did, starting with milk as my first trial food), I recommend testing in the order shown above so you can let your gut heal for an extra month before attempting the real heavy hitters. Good luck! Our current herd isn't nearly as destructive as when the ornery and horned Abigail was a member of the crew. But Aurora is a major climber and never grew out of her childhood obsession with dancing in the mineral feeders. 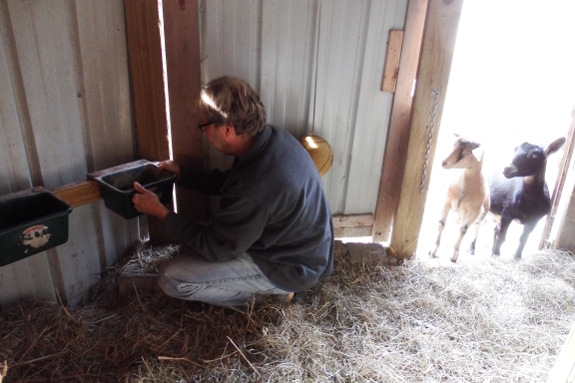 Time for Mark to move one of the two to a new spot in hopes we can keep our doeling's feet on the ground where they belong. Brussels sprouts are so loaded with yummy goodness they're leaning over. The handy thing about waiting to do any interior design until I'd written a book covering the topic is that I can learn from other trailersteaders' trial and error. Turns out wood paneling is best sanded pre-painting, so I scuffed up the finish thoroughly in preparation for dealing with the bottom half of the wall. 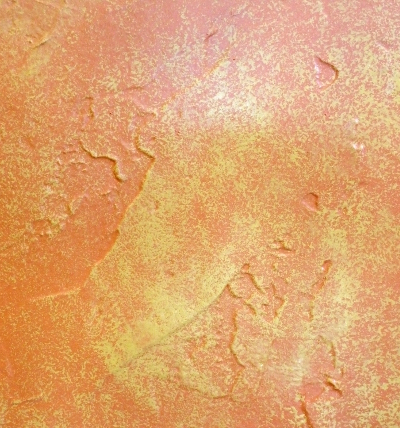 I'd also gotten it into my head that I wanted to create a pseudo-stucco texture. So rather than simply filling in the indented lines of the paneling (so it didn't look so much like painted panels), I went a little nutty with the joint compound. As you can see in the image above, I also used mesh tape along the true seams so the thicker-than-usual spackling doesn't crack. Here's part of the texturing on the upper half of the wall. Time to let it dry, then primer and paint. Fingers crossed my experiment looks good rather than turning into an eyesore. The Willow trees we are growing for the building with living trees experiment are well over 6 feet and might be ready for sculpting soon. I'm getting a rather absurd amount of joy out of painting my office wall. I suspect that if the area was even twice a large, it would be a chore rather than a delight. 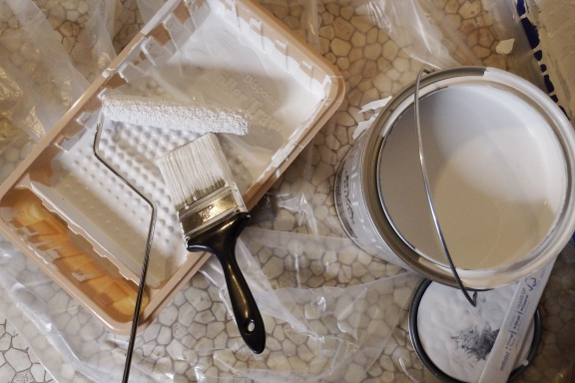 But as is, it only takes about 15 minutes to put on a coat of primer or paint, so I'm always itching for another round. 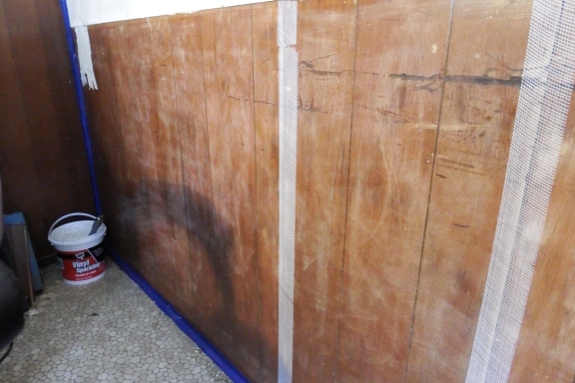 Here's the top half of the wall after the first coat went on. 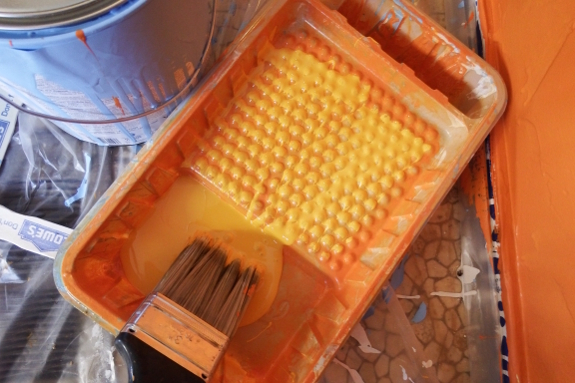 The bottom will be an earthy yellow/orange/brown, simulating a landscape in two blocks of color. Stay tuned for more photos once the paint dries! Broccoli continues to produce for us and is still one of my favorite garden items. So how did my pseudo-stucco turn out? I have to admit that it doesn't look all that much like stucco. If I was going to repeat the project, I might follow Roland's advice and add some sand for fine-grain texture. Alternatively, I might just try to use stucco itself since even non-glossy paint has a plasticy sheen once dried on the wall. 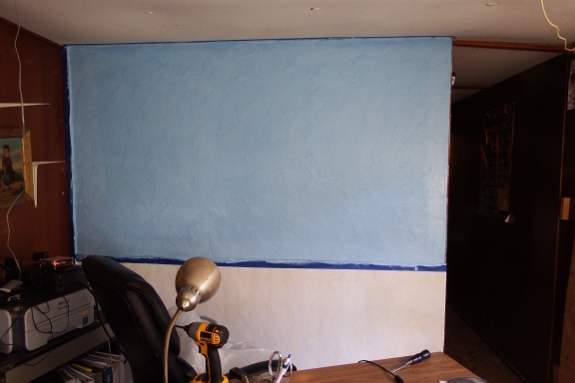 Those caveats aside, I think my accent wall turned out really well...even if it doesn't look much like stucco. I really like the texture (wouldn't change a thing there!) 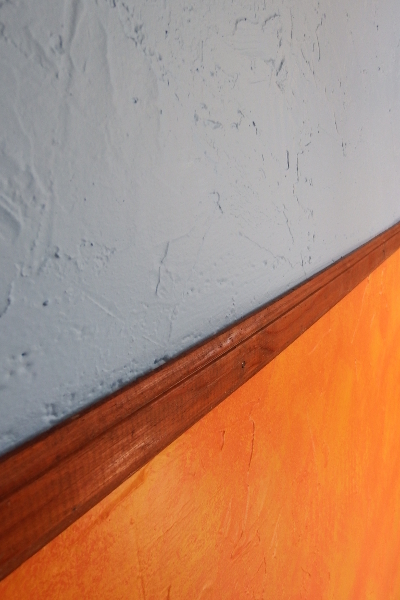 and my two-tone bottom half of the wall looks really good up close. I wasn't so sure after I put down the first coat, though. 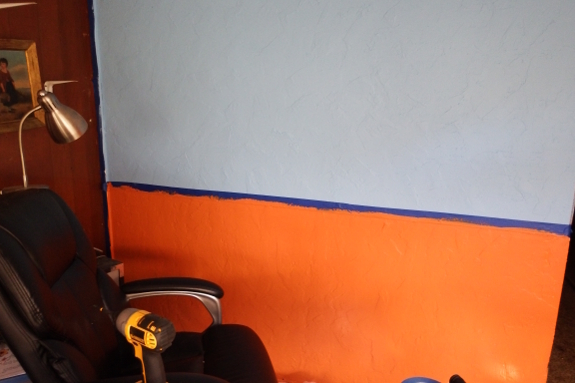 I selected the paint colors online then sent Mark to pick them up, and I wasn't quite expecting my orange-brown to be quite so, well, orange. 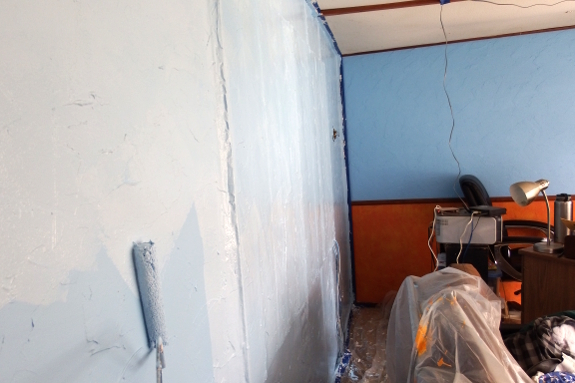 Luckily, I'd never planned to paint the whole wall in one color. 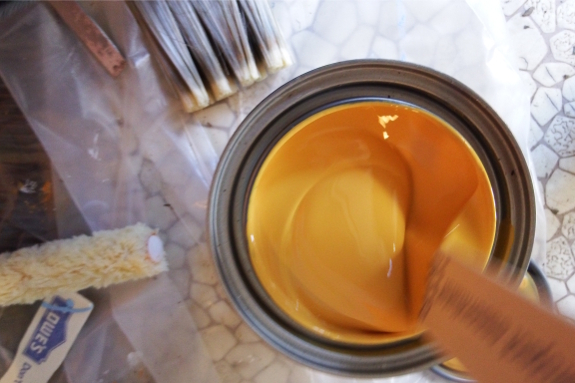 After putting down two coats of the rather neony hue, I pulled out the yellow ochre I'd also selected. 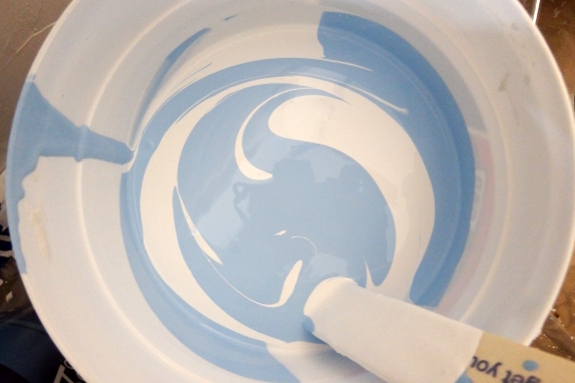 Brushing a very small amount of paint onto the top of a roller tray, I barely wet a roller in the paint. Then I lightly rolled over the textured wall, pressing down more firmly in raised areas that I wanted to accent. 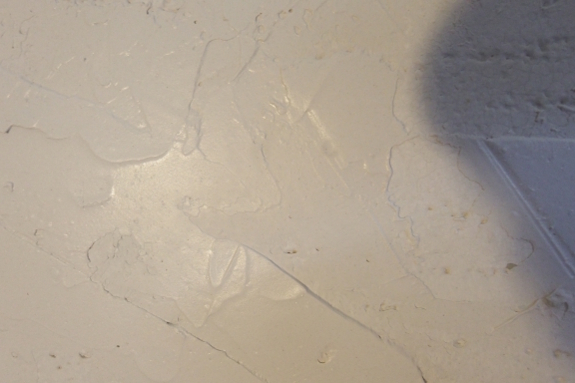 The result was a very rocklike texture that definitely made the wall work. Tack the trim back in place and I could almost forget my office is located inside a trailer. Now, which wall should I tackle next? The biggest Super Moon since 1948 will be visible Monday and Sunday. I dropped by Sugar Hill on a frosty Saturday morning for a quick hike. After spooking a pair of does, I caught back up to them further along the trail. I didn't take a photo, but I passed a flock of turkeys too --- unsurprising since I've seen more of the latter this year than ever before. 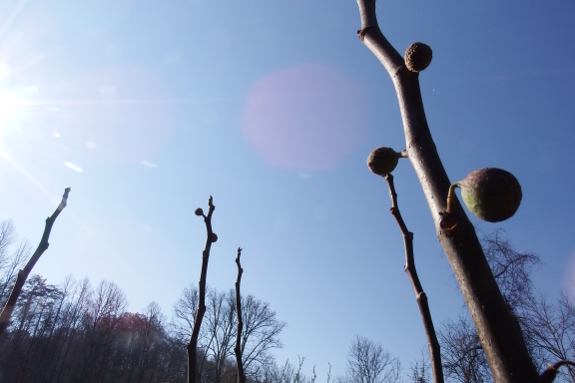 We've been waiting until our fig is completely dormant before protecting it for winter. 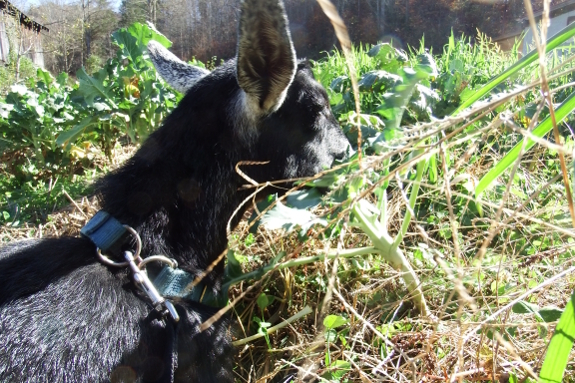 The last leaves fell today and Anna picked the unripe fruits to give to the goats. Poor Artie developed a bald spot on one side of her neck a few weeks ago. I assumed she'd just scraped it on something, but the patch got bigger over time and then one popped up on the other side too. I'm not 100% certain what's going on, but the internet suggests this may be a normal reaction by some does to the hormone changes associated with drying off. Artemesia has been slowly backing off on letting her daughter nurse for a while and now she's pretty close to dry. It's also possible the issue could be a mineral deficiency or a parasite infection, though. I figure the latter's pretty unlikely since Artemesia hasn't been scratching the bare spots and I've seen no sign of critters. To rule out the former cause, I'm getting some fresh minerals to go with her kelp just in case our doe is unwilling to eat out of Aurora's former sandbox. Have any of you had a problem with balding does? What, if anything, did you do to fix the problem? We've got four Hazel Nut bushes. Just as they're dropping the last leaves Anna decided it was okay for Artemesia to nibble on a few. I'm trying a different method of winter-protecting our largest fig tree this year. I call it the hay porcupine. I would have considered this technique far too wasteful if we hadn't dramatically overbought on hay in fall 2015. 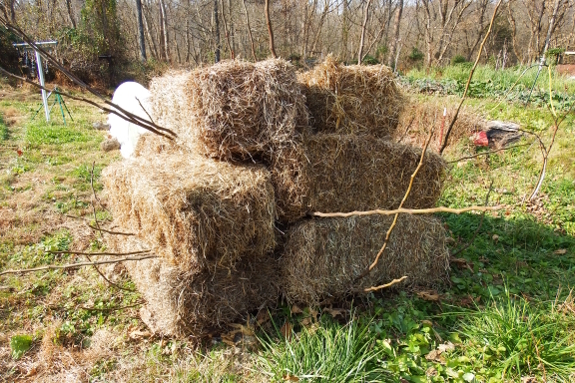 But I'd already decided to mulch with the eleven leftover bales that our goats would prefer not to eat. 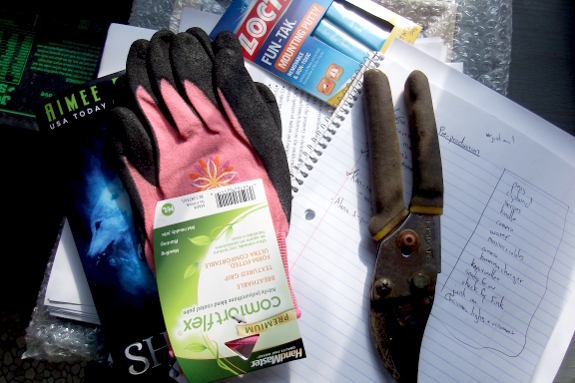 Why not use them first to insulate our fig's many branches? 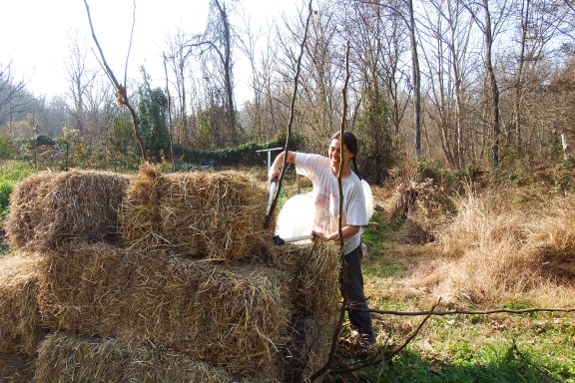 After snipping back limbs that spread past the protection of the hay, I put one final bale on top. 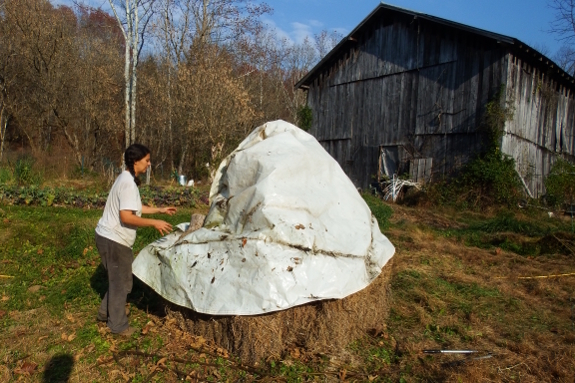 Then I topped it all off with a tarp. 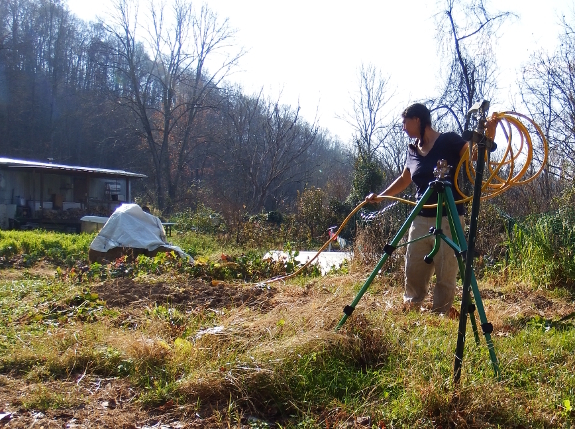 Only time will tell whether the hay porcupine trumps the leaf cylinder as our fig protection method of choice. I left the hoses out longer than usual this year because I was debating watering a few more times. After all, the ground is bone dry. Still, the few things still growing in the garden --- leafy greens, lettuce, broccoli, brussels sprouts --- seem to be doing okay despite the drought. And with nights hitting the low 20s, I was afraid the hoses were going to freeze and split. So I gathered them up and put them away. 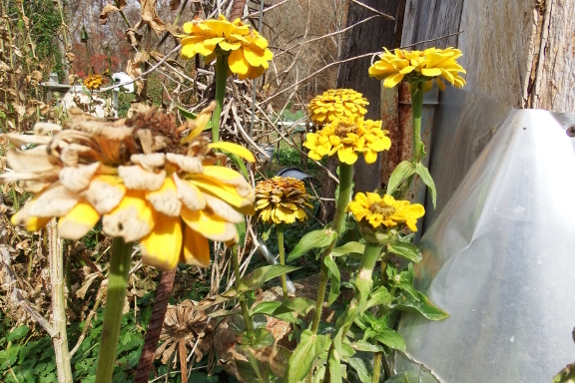 From now until spring, the garden will have to depend on rain. There was more dancing compared to last year. We decided to go with Monte Cristo again....he's a sure thing. How much does a high quality goat date cost these days? We paid 75 dollars and felt like we got our money's worth. Artemesia keeps going into heat when Monte's mom is out of town. This time, I called at the first sign of yelling. "There's only a little bit of clear mucous, no flagging yet," I said. "I'm going out of town first thing tomorrow morning," Monte's mom replied. 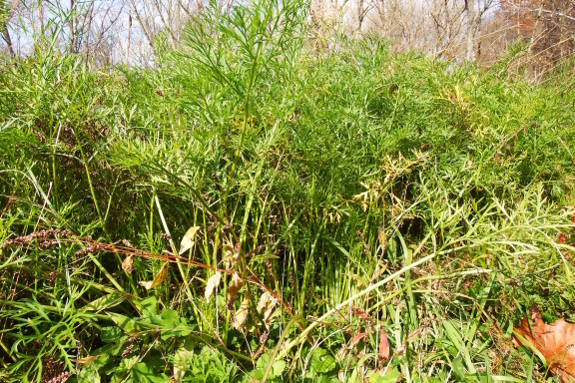 Luckily, by the time we got to the location of our picnic lunch, Artemesia was starting to flag. And when we brought her to Monte, she was definitely in standing heat. It took him a few tries, though, to get in position when her tail was up and out of the way. But we're hopeful Artie now has another set of buns in the oven. Not that we can do anything about it, but we're hoping for two boys this time around. Artie has such prime genetics that it would feel wasteful to eat girl kids, so boys would take that difficult decision out of our hands. 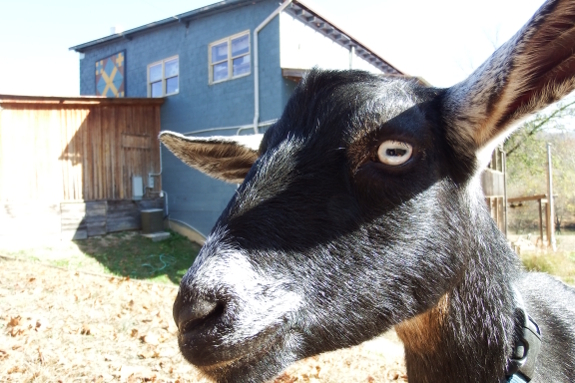 Either way, you should mark your calendars for April 10 for the first round of cute goat pics! National Black Cat day is today. I guess Huckleberry will be expecting an extra cat treat this evening. 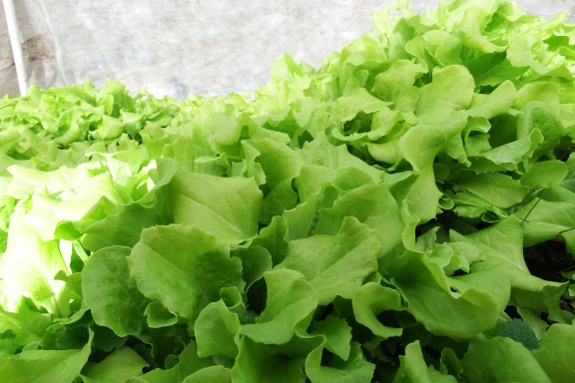 The uncovered lettuce in the main garden is finally biting the dust. Luckily, the quick hoop we erected near the end of October has sheltered our younger bed. These crisp green leaves are ready to eat now and if the weather remains mild might feed us for two more months. The Oregon battery powered chainsaw continues to impress us. We had to take out this Walnut stump to make the new quick hoop fit. 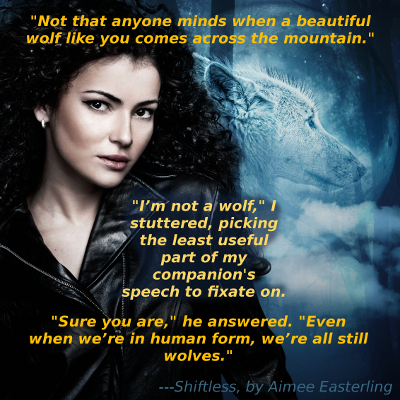 Those of you on my email list will already be aware of the secret I've been hugging to my chest for the last 2.5 years --- my second life writing about werewolves. To be honest, fiction has always been my greatest passion. Non-fiction serves a purpose --- I love to learn what has succeeded or failed for others and to pass on the favor by sharing my own experiences. But fiction is the treat I look forward to at the end of a long, hard day. In fact, I read about thirty novels for every non-fiction book I open, with genres running the gamut from fantasy to women's fiction --- basically, I read everything except horror and poetry. When I was in high school, I was astonished to find Isaac Asimov in the non-fiction section with a whole shelf of books to his name. I'd enjoyed his fiction (particularly the Norby series he wrote with his wife) and was astonished to see that he had a line of non-fiction as well. So if you've ever wondered why I haven't written quite as much non-fiction in the last couple of years --- that's why. Aimee's been busy taking over my fingers and typing out her tall tales instead. 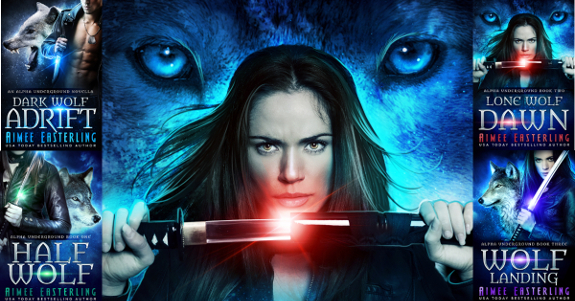 I know most of you don't read urban fantasy, so I won't bore you with details about her books in the future. But if you're interested, I'm running a big sale on my 2016 series at the moment with the prequel free and the other books marked down to 99 cents apiece. Meanwhile, Shiftless is always free on all retailers as a sampler of my earlier fiction work. 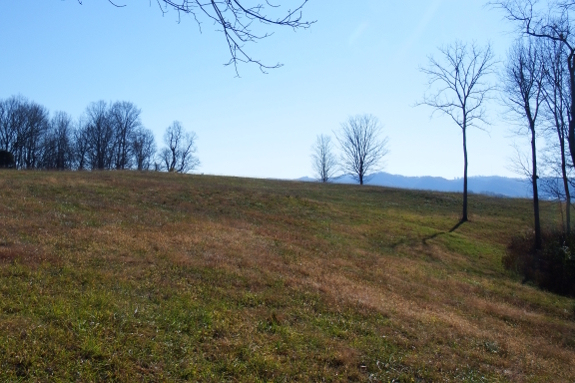 And even if you are sublimely uninterested in fantasy, I thought you might like to see yet another way that homesteading has helped us fulfill our dreams. By keeping our expenses low and growing much of what we eat, Mark and I are able to pursue our passions to the hilt. Who knows what will come next? Our longest quick hoop ever stretches almost the entire distance of the garden. We feel lucky to have been unaffected by the wildfires currently burning in North Carolina, Tennessee, Kentucky, and elsewhere. Even the smoke has mostly passed us by --- the photo above captured a rainy Saturday morning rather than the smoky haze it initially appeared to be. I doubt that extended sprinkle did much good in the fire-prone regions since it hasn't even managed to wet our parched soil..and we're officially only in a moderate drought. 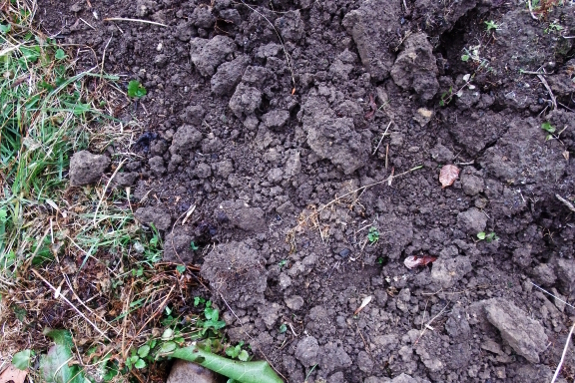 This bed where I dug carrots a couple of weeks ago still looks very much like it did the day I pulled the crop out of the ground. Of course, I have to admit that our farm tends toward soggy and I'm actually a little glad for the ease that dryness brings. But I'll be hoping for rain to quench the flames elsewhere and to water gardens for those of you whose soil is now bone dry. Here's hoping the drought is a mere memory by the time spring gardens hit the ground in 2017. My classmate from film class posted one of our projects on his Youtube channel. One thing we learned was that his video camera was not as compatible with my boom microphone which results in the audio being a little tinny. The assignment was to recreate a scene from a famous movie and our group settled on the John Hughes classic The Breakfast Club. "Please show the whole finished wall - if you can - it looks nice in snippets but would look even better as a whole finished project?!" I was going to wait to take after photos until the room was more in order, but didn't want to leave you hanging too long! So here's the completed accent wall, with lots of clutter in front of it since I had to move furniture to access wall two. 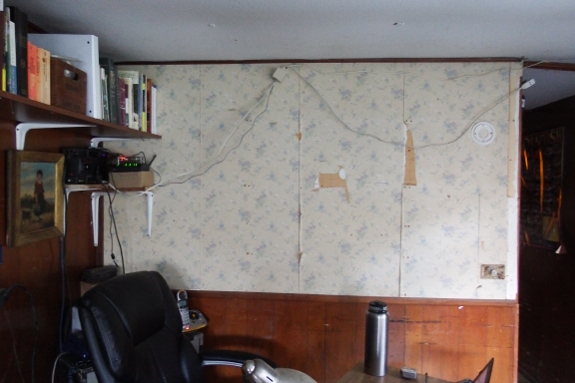 The wall on the left side of the photo is this week's project. It's on the north side of the trailer and is very irregular --- we boarded up absent windows, and the wall beneath what was once a hole was pretty water-damaged when we got the trailer. Rather than replacing large swaths of wall, I'm hoping some roughing up with more texturing will do the trick. Stay tuned for more photos as the project progresses. 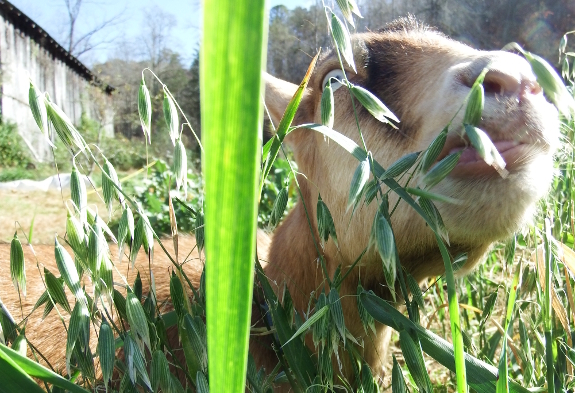 Maybe a lush patch of oats becomes crispy to goats in the cold weather? We've had such a mild autumn that we're still burning last year's firewood. In fact, we haven't even split any firewood yet --- we're still working through the stockpiled bounty we stacked on the back porch while cleaning out the shed last spring. 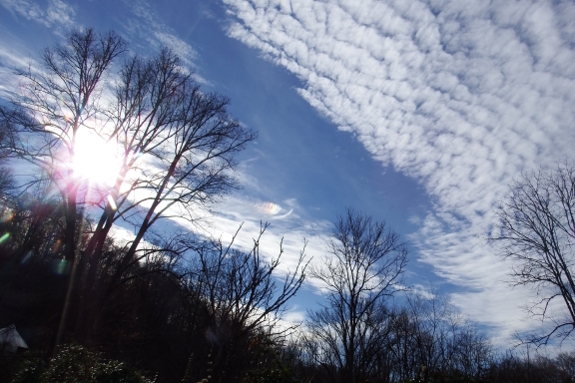 But the weather abruptly shifted at the beginning of this week. A low of 16 means frozen ground, a skim of ice on pools in the creek...and waking up to a waterline frozen where it enters the house. In large part, I think the problem is that I didn't ever get around to unhooking the outside hose and closing that access hatch. 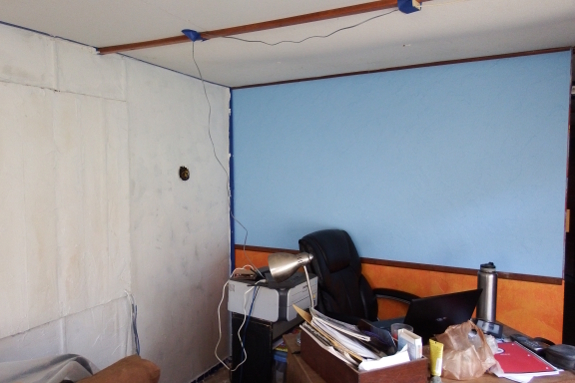 But Mark went ahead and added more insulation to our inlet anyway. Luckily, our freezes don't tend to burst the line, they just mean we have to wait until the sun hits before we enjoy running water once again. A small price to pay for our isolation out here far from any city water system. It's a struggle to get a cute image of Aurora these days. Maybe she's going through her sullen teenager phase. She's been more vocal since her Mom came back last week smelling like a buck. One summer, I decided I wanted to learn to identify clouds. My new enthusiasm hit a major roadblock, though --- in our neck of the woods, pillow-like cumulus clouds are by far the most common and I couldn't seem to spot anything else. 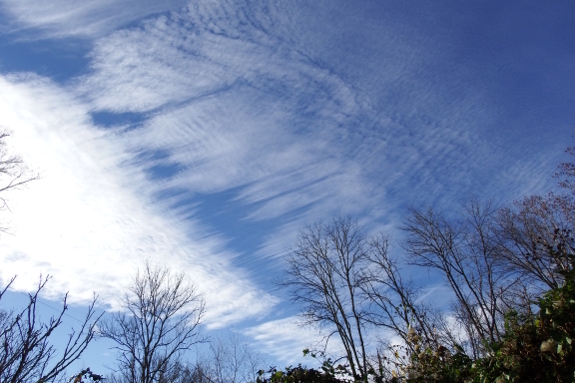 The tufty cloudlets in this post are higher and presumably drier than the cumulus clouds I'm more used to. So maybe they are associated with the drought after all? Turns out Thanksgiving was the perfect day to find a good spot for Anna's new sign. Mom and I are very easily amused. 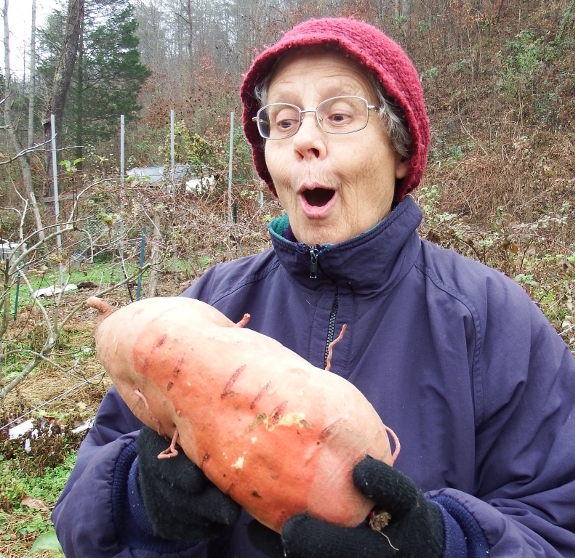 I pulled out one of our biggest sweet potatoes of the year for Thanksgiving dinner and she immediately exclaimed: "It looks like a baby pig!" "How much do you think it weighs?" I asked. Mark guessed 2.25 pounds, Mom guessed 2.5 pounds, and I guessed 3 pounds. We were all wrong. The baby pig weighed in at 3 pounds and 4 ounces, enough to serve as a side for eight people instead of just three. We did some Black Friday shopping today in the form of an 80 straw bale delivery. Big thanks to Walter and Dawson for their time and a nice Punkin update. 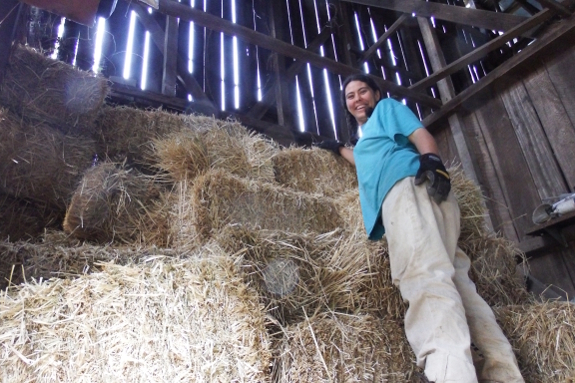 Building a mountain of straw in the barn was a delight with the hauling assistance of the Kubota. 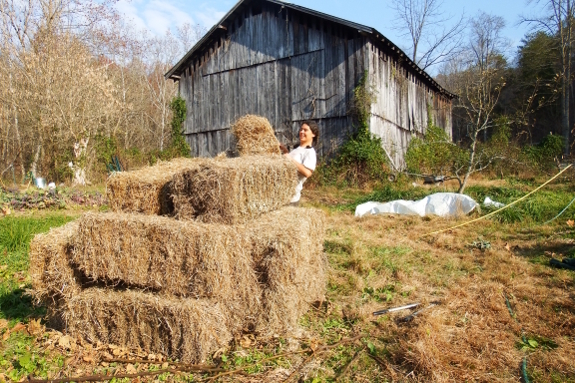 Using the pyramid approach, I was able to stack most of the bales (with Mark carrying them in from the outside). 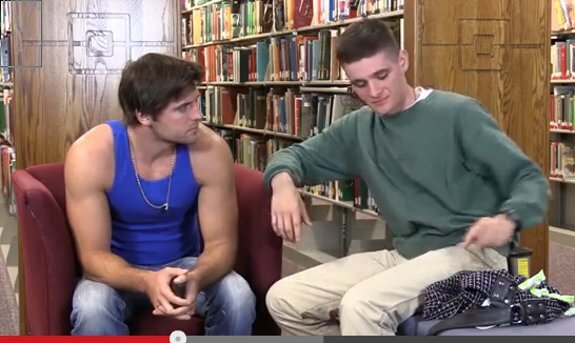 I eventually had to relinquish control of the project to the tall guy with upper body strength, though. There's a limit to how many bales I can throw over my head and Mark's extra eight inches made a big difference putting away those last dozen bales. Walter gave us a Jarrahdale pumpkin as a bonus with the straw. It has a slate green color with a hard skin and originates in Australia. We should make a point to save some seeds and see how they grow here. What was the straw bale load limit of the Kubota X900? Making the load three layers high maxed us out at 15 straw bales. They're all going to be used in Mark's final film project of the semester, tentatively titled Lemons for Christmas. It's a big, exciting collaboration for the two of us. I wrote the script, Mark hired actors and a director of photography, then I pulled together props and pre-production checklists. Now for filming, where Mark will be the big guy on set! Stay tuned for more pictures, then, eventually for a video as the project comes together. 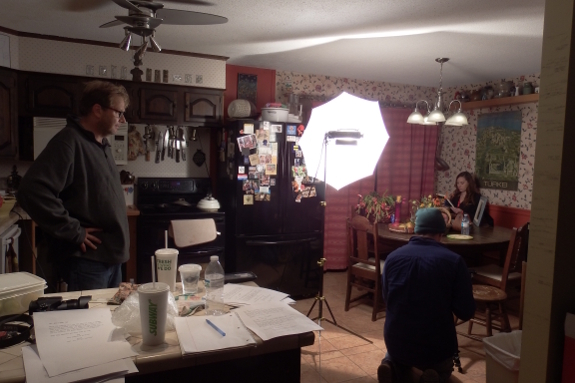 Monday, Mark and I filmed Lemons for Christmas with the help of four very amazing people. It was an experience unlike any I'd ever had before and I felt so lucky to have been able to take part. 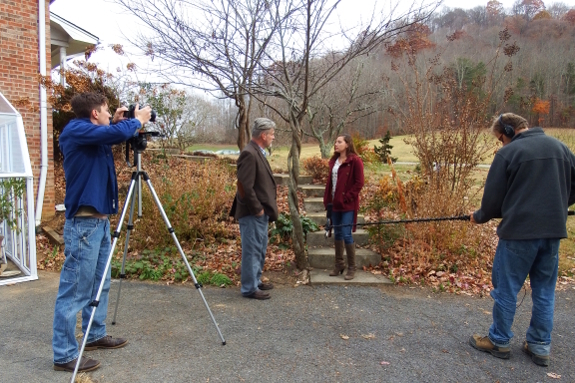 Our two actors were professional, believable, and just plain fun. I wasn't expecting such nice, down-to-earth people who could also reliably turn into characters on command. The upshot? 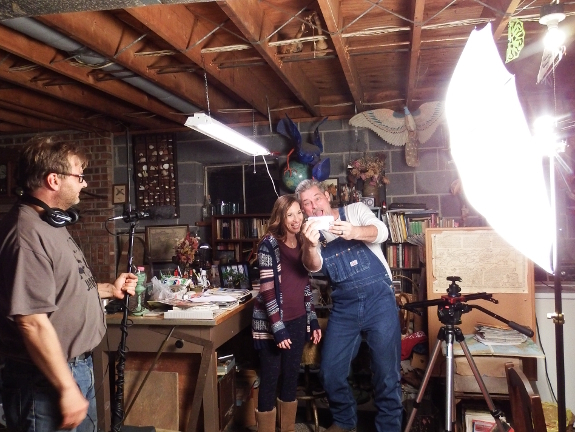 I highly recommend Myranda and Jim for all of your filmmaking needs. Mike Fink was equally astonishing as a director of photography. Mark hasn't taken a cinematography course yet...but I think he got about a month's worth of education in those six short hours. 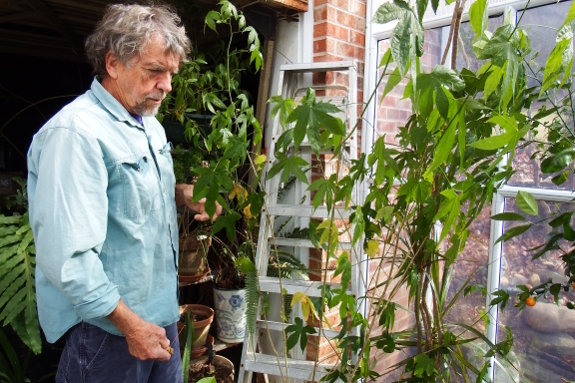 And don't forget Ken, who lent us his lemon tree, his greenhouse...and actually his entire house...for a very long afternoon. A huge thank you to the entire team, who turned a student project into an event! Six hours of filming should turn into six minutes of video...we hope. Oh the yelling and the moaning! 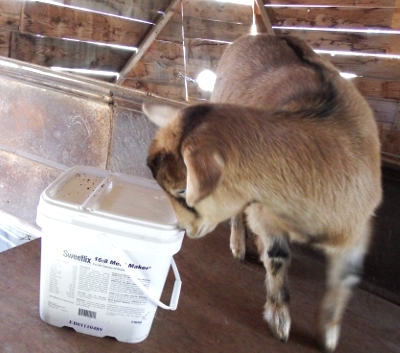 Taking Artemesia away to be bred seemed to flick a switch in our seven-month-old doeling. Previously quiet, little Aurora abruptly found not only her voice but also her temper, head butting her mother mercilessly when I took the two out to graze. 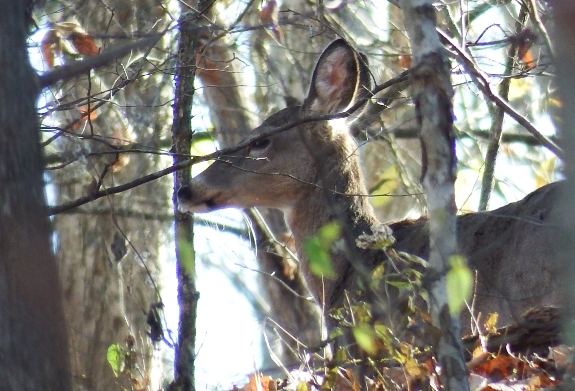 At first, I assumed the change in behavior was due to the buck scent, which hung on Artemesia's fur for several days after the event. 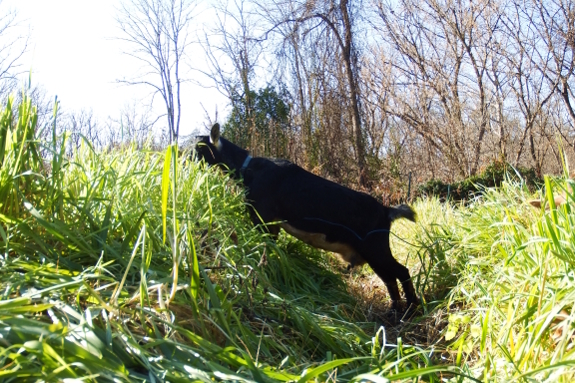 But then, Saturday, I noticed Mama Goat's udder looked very different. I'd thought she was easing Aurora off the milk bar over the last couple of months, but her teats had remained full and taut with liquid. Now, though, they're beginning to shrivel up and one half of her udder is apparently quite dry. My new hypothesis is both simpler and more complex. I suspect that being impregnated changed Artemesia's hormone balance and she abruptly realized she needed to stop feeding Aurora and save all of her energy for the new buns in her oven. Cutting off the ever-flowing milk was a hard pill for little Aurora to swallow, so she acted out like many of us do when we don't get our way. 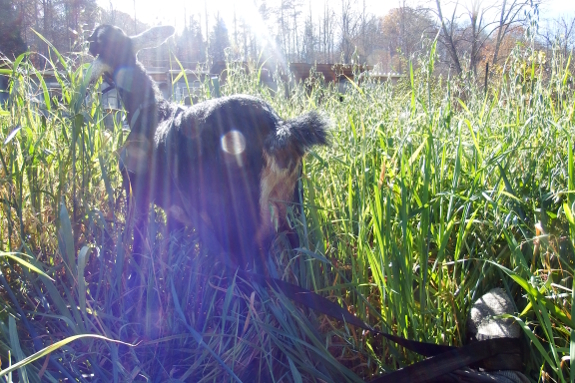 With weaning nearly complete, though, our doeling's sunny disposition is returning. If I'm right, the other half of Artemesia's udder should go dry in short order and we shouldn't see any sign of heat during the first full week of December. Fingers crossed the goat drama of the winter is behind us and I can now return to my favorite part of caprine management --- spoiling our girls. 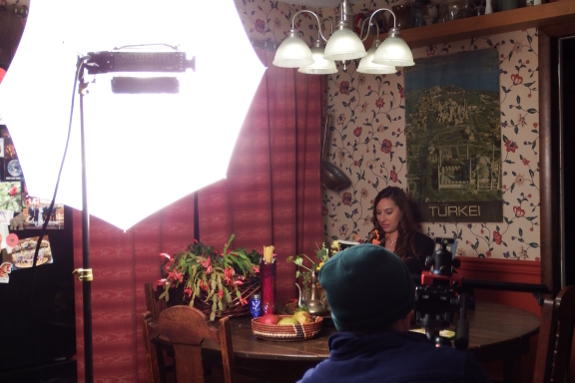 A behind the scenes look at one of our indoor scenes from Monday.